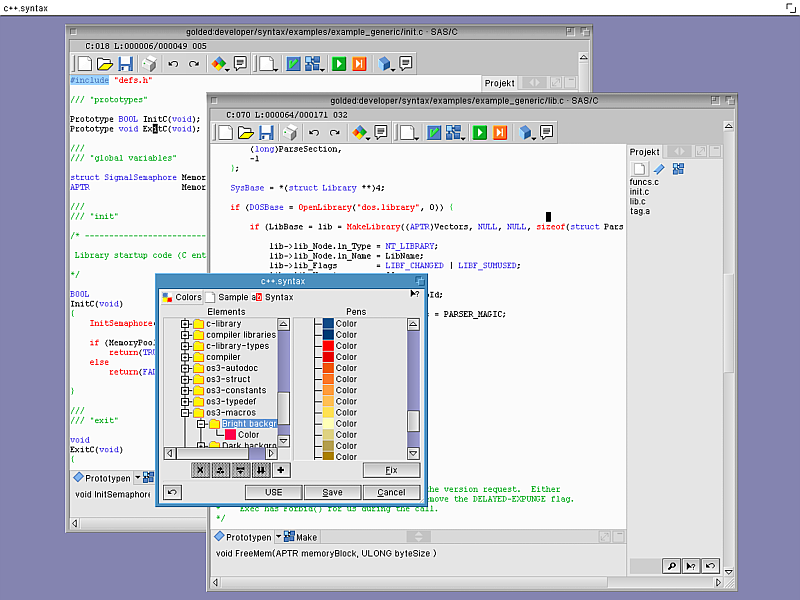 Cubic IDE is a powerful, modular Integrated Development Environment (IDE) for AmigaOS3™ and MorphOS developers. It is designed to assist programmers during all stages of development: editing, compilation, writing the installation script, documentation and creating a web site for your final product. 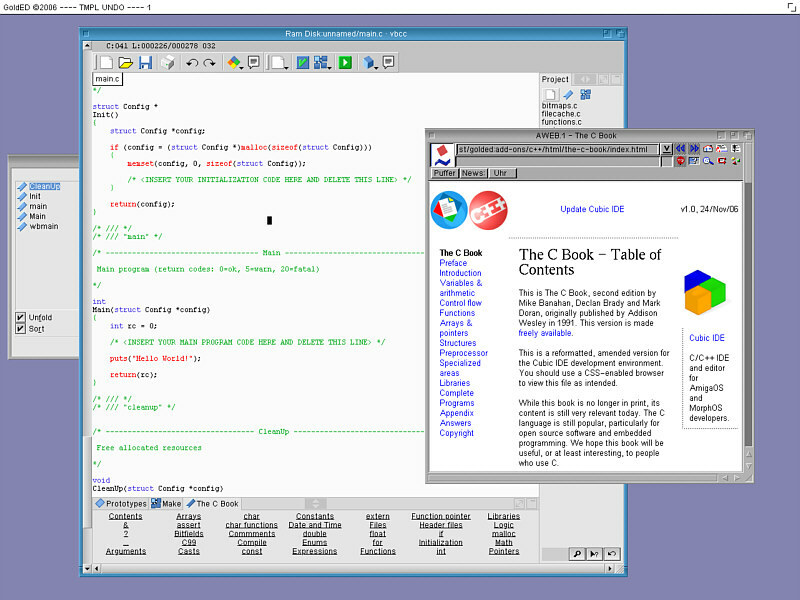 Central component of Cubic IDE is GoldED, a fully-featured developers editor for AmigaOS3 and MorphOS. 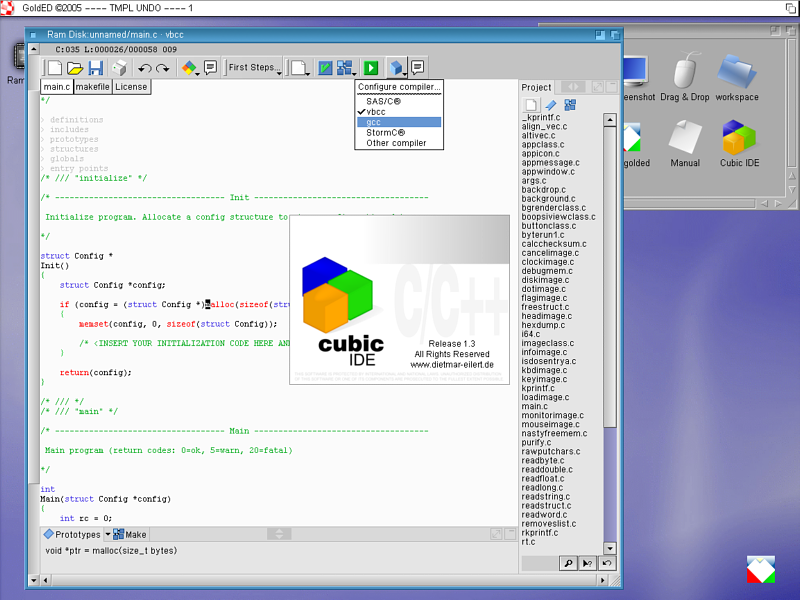 Cubic IDE includes the Installation Wizard, an AmigaGuide authoring mode, LISP and Rexx support packages, the HTML editing environment Webworld and various other add-ons. Together, they form a set of tools for all steps of your development process, from writing source codes and installations over documentation to creation of a web site for your final poduct. The editor offers all functions you can expect from a modern program. Unlimited undo and redo, configurable syntax highlighting, templates, folding, automatic backups, macro recording and extensive rexx support. Advanced layout and block functions. Optional input aids including context-sensitive completion and automatic case correction. All aspects of the Cubic IDE interface are configurable: fonts, colors, toolbars, menus, mouse, etc. Tabbed dialogs simplify the configuration. The software can handle an unlimited number of open screens and windows. Background processes like printing are multithreaded and do not block the user interface. The editor recognizes file types and automatically adjusts the editing environment. For example, the menu will show compiler-specific functions after loading a C source code. Cubic IDE seamlessly integrates with SAS/C, vbcc, gcc and the StormC3 development environment. Free C/C++ compilers and software development kits included for your convenience, for AmigaOS3, MorphOS, PowerUP and WarpOS (all installed with a mouse click). Revised online version of "The C Book" included for C beginners. Configurable references system for includes, source codes and other material helps you with finding information quickly. The QuickInfo function constantly shows information related to the word under the cursor (e.g. parameters of OS functions). Source level debugger support for StormC3 users (breakpoints are displayed next to the text). The editor automatically highlights matching brackets. Symbol browser lists all functions, structures, labels etc. defined in your source codes.